Gr 7 Up –Melinda is already a pariah on her first day as a freshman at Merryweather High. ANDERSON, Laurie Halse. Speak: The Graphic Novel. illus. by Emily Carroll. 384p. Farrar. Feb. 2018. Tr $19.99. ISBN 9780374300289. Gr 7 Up –Melinda is already a pariah on her first day as a freshman at Merryweather High. She involved the police in an end-of-summer party, and now everyone shuns her. Unable to tell anyone what actually happened at the party, Melinda withdraws more and more into herself. Rarely speaking, ditching classes, and ignoring school assignments, she spirals downward into apathy and depression. One of the few people to reach her is her art teacher, who helps her express with art what she has so deeply and painfully buried. 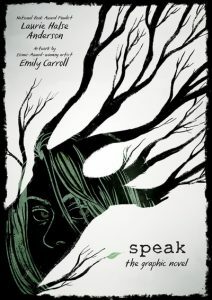 This potent retelling of the modern classic Speak blends words and images to create magic: a new representation of a teen whose voice is ripped from her, the battles she must wage to find it again, and the triumph of finally being able to speak out. Carroll’s grayscale artwork perfectly depicts the starkness of Melinda’s depression through strong ink lines and striking panels that rely on pencil and charcoal textural effects for the backgrounds. The characters are distinct and the action flows naturally; it is amazing how closely this version evokes the style and feeling of the original. The dialogue is pulled directly from the novel and enhances the progression of the story and of Melinda’s emotions. VERDICT This gripping, powerful work will introduce Speak to a brand-new audience and enthrall longtime fans. Admirers of Carroll’s Through the Woods will also appreciate this timeless tale.–Kelley Gile, Cheshire Public Library, CT This review was published in the School Library Journal January 2018 issue.